Diver William Bartlett had just started exploring a 300-year-old shipwreck with a metal detector late last month in the waters off Florida's Atlantic Coast when he found his first Spanish gold coin. Then one coin became two, and two became so many he had to stuff them into his diving glove. When he resurfaced, "every fingertip was stacked with gold coins, and we knew then we were into something super special," the captain of his boat, Jonah Martinez, said. 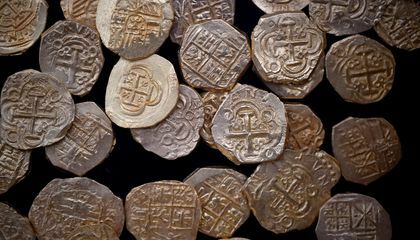 Over the next two days, Martinez, Bartlett and another treasure hunter, Dan Beckingham, found 350 coins worth $4.5 million, the most valuable find from the 1715 shipwreck site in recent decades. Eleven treasure-laden ships that made up the 1715 fleet were heading to Spain from Havana on July 31, 1715, when they encountered a hurricane off Florida's central coast. The winds and waves smashed the ships onto reefs, claiming as many as 1,000 lives in one of colonial Spain's biggest maritime disasters off Florida. Now it's turning out to be a treasure trove. In June, a family of treasurer hunters found $1 million in gold coins in an area south of the latest discovery. 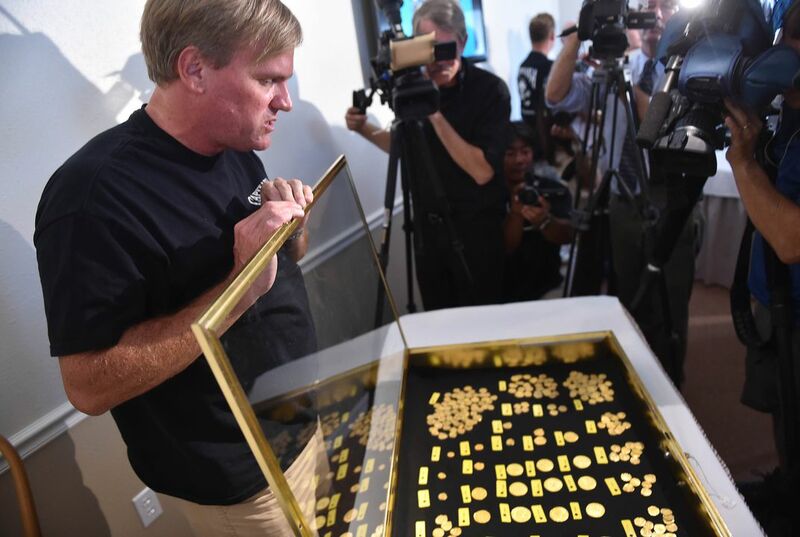 The latest group of treasure hunters to find millions of dollars in gold coins from the 1715 fleet shipwrecks said they believe "magic" has played a role in the discoveries this summer, coming on the 300th anniversary of the sinking of Spanish colonial galleons. "We all enjoy doing this, and we all know the odds when we're out there and finding nothing," Martinez said. "To be able to go and do that, and then succeed in something like that, is more than any treasure." They expect more discoveries to come, with $400 million in coins still undiscovered in a coastal area stretching from Melbourne to Fort Pierce, known as Florida's Treasure Coast. "Five years ago, before I got into this business, I would have told you that magic is in fairy tales," said Brent Brisben, whose salvage company, Queens Jewels, owns rights to the 1715 fleet shipwreck site. "I truly now believe that there is an energy that pervades these shipwrecks, that I can't quantify. I truly believe that these shipwrecks wanted their story to continue, that this magically happened on this anniversary because this story still needs to be told and it's currently unfolding." Anywhere from a dozen to two dozen subcontractors have signed up with Brisben's company to search the shipwreck site each summer. The subcontractors are responsible for their boats, crew and other expenses, which can tally up to $50,000 each summer. Brisben's company purchased the salvage rights to the shipwreck five years ago from the family of treasure hunter Mel Fisher, who won a lengthy court battle in the 1980s for the rights to the shipwrecks. During the legal battle, the Spanish government never asserted an interest on the lost treasure and so it has no claim on it. The state of Florida did assert a claim, and it's entitled to 20 percent of found artifacts for display in a museum in Tallahassee. The remaining discoveries are split between Brisben's company and whoever finds the treasure after a federal judge in Miami signs off on it. Because over 1000 people died in the boats, but the 4.5 million dollars was found. Why cant someone take me to go treasure hunting, they found a lot. That would be so cool to find something that old. This article is cool because not only did some one find a few gold coins but a millions worth of gold coins and I'm really into treasure hunting so this was a cool find. This discovery is both a tragedy and a success because the men who were sailing died trying to transport money and slammed into a reef and never being seen again till about 300 years later which is sad because the people who were sailing the boat were forgotten about. it was a success because some ones life was changed by the money that was found and probably made his life easier. The lead is only two sentences and tells all the info on what the article is going to be about. The inverted pyramid was probably the layout for this article. In the beginning of the article, the writer focuses on the most recent findings. Then it eventually leads to the history and left the least effective information for the end. This story is a human interest story. Its a very well written article because it has all the details and uses direct quotes from actual people who found the coins. I really thought this was a cool article because it talked about something interesting that made me actually want to read the article. In this article, the inverted pyramid style was not used; to grab the reader's attention, an interesting first sentence was used. This made the reader want to read the whole article to find out about the gold coins. Personally, I'd never heard of the "treasure coast," so I found the article very interesting! I'm surprised it is so close to me, yet I'd never heard of it. In my opinion the lead to the story was perfect. It talked about who has been looking for the treasure and finally found 1$ million in the gold coins! He took a bad situation and turned it into national history by finding the coins. He went into the search not really looking for gold coins just kind of looking for interesting things and he came back with even more! 1. Its a story of tragedy and and success by the lives that were lost that day in Spain's biggest maritime disaster off the coast of Florida. Its a success by the 4.5 million dollars worth of gold coins the diver found. 2.My opinion is i feel it is a great find by this diver off of the coast of Florida. I think it was a great abandoned treasure off the coast of Florida. There are several ways that this discovery could be both a tragedy as well as a success. In my eyes, it could be a tragedy because now explorers know there is more to the missing puzzle. Although, it is a success because this part of the puzzle solves a piece of history. The success of the story is the fact they found millions of coins, this may also lead to further artifacts to be found in the area. The tragedy of this event is that many people were killed and it unfortunate that it ended in that way.